You can soak the bananas in the sauce or drizzle the sauce over them like this. Thai grilled bananas (Klauy Ping – กล้วยปิ้ง) come in many shapes and forms. You can see them in the first image in my post on Or Tor Kor Market (which, by the way, should be on your itinerary should you visit Bangkok). Some are split open on one side and grilled in their peels. Some are peeled, skewered whole, and dipped in various syrup concoctions. All of these grilled bananas fall into the broad category of Kluay Ping. But when one refers to Kluay Tap (กล้วยทับ), it’s bananas which have been grilled and pressed — a subset of Kluay Ping — that are in view. And that’s what we’ve got here — burro bananas (read about them in my post on Thai fried bananas), grilled whole and pressed. The sauce is made with coconut milk and unrefined cane sugar (Nam Tan Oi น้ำตาลอ้อย), also known as panela or piloncillo, with a touch of butter added. Instead of grilling the bananas whole, you can also cut them crosswise into 1/2-inch thick slices, skewer them, and proceed as explained below. Make the sauce by heating the cane sugar, water, coconut milk, and salt in a medium saucepan over medium-high heat. Once the mixture comes to a boil, turn down the heat to medium and reduce the sauce by approximately ⅓. Stir in the butter. Let it cool. The sauce will thicken up to maple syrup consistency once it’s cooled. In the meantime, peel the bananas and grill or broil them until the exteriors become slightly charred. Place one grilled banana on a chopping board; place a flat plate on it and press it down. Once pressed, the banana should measure about ¼ inch in thickness. Repeat with the remaining bananas. 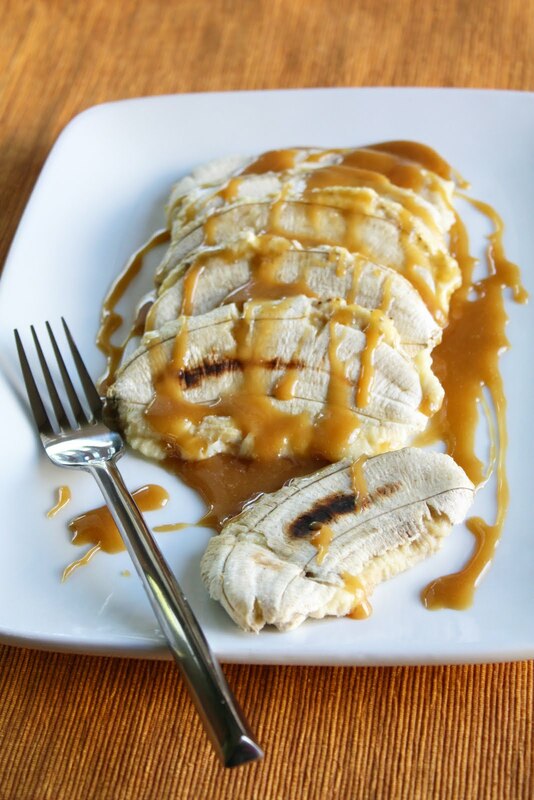 You can dip the pressed bananas in the sauce or arrange them on a platter and drizzle the sauce over them. Serve warm. Gosh that looks bloody delicious! That sauce sounds lovely! Can you get panela in most asian grocers, or can you replace it with brown sugar or palm sugar? Arwen – You have better chances of finding its Chinese equivalent 片糖 (piàn táng) at most Asian stores. Where I live, panela is much easier to find, though. Not every Asian store has this, but every Hispanic market does.